Granola with Greek yoghurt, redcurrants and raspberries. I make different nut blends according to what I happen to have on hand. Here I used unpeeled almonds, walnuts, pecans, hazelnuts, cashews and pistachios. Once I got a small bag of granola and a bar of rose chocolate as a gift from a friend. In all its simplicity and warm-hearted vision, it is still one of my favorite gifts ever. We tend to bake one tray of granola once a month or so, store it in a glass jar, and eat at breakfast with Greek yoghurt and fresh fruit. If you want to make your granola gluten free, just choose a different grain or go for gluten free oats. In a large bowl, combine grains and nuts. Mixing with a wooden spoon, add maple syrup, oil, salt and vanilla bean powder and continue mixing until the ingredients are fully blended. Last, blend in gently the egg white foam. Spread mixture evenly on an oven tray covered with a baking sheet. Bake in the middle of the oven for 30 to 45 minutes, stirring after the first 20 minutes. Once the granola is golden brown and looks ‘ready’, take it out of the oven and let cool for a good while until moving it from the tray. 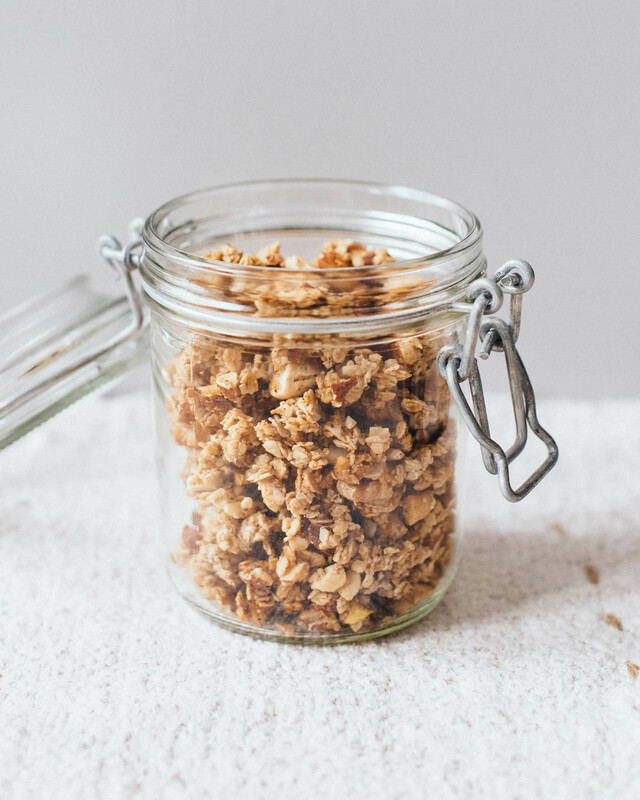 To retain its crispiness, granola should be completely cooled before storing. This is a basic recipe that I use all the time. 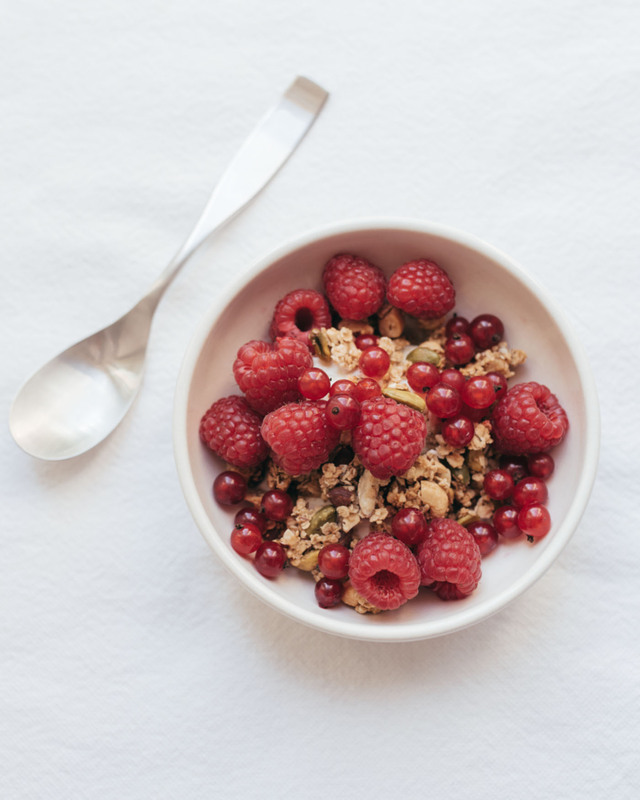 I like to add toppings such as berries or cinnamon dust or a little bit of chopped dark chocolate only when I am eating, so I keep the granola base really neutral. However, feel free to experiment with your favorite flavors. Warming spices such as cinnamon work well in winter. Coconut flakes and chocolate chips bring richness, dried fruit and berries sweetness. Spices can be added to the raw granola mix while coconut flakes and dried fruit should be added only after the granola is baked and cooled.